Quite possibly the sweetest Valentine's Day gift ever! 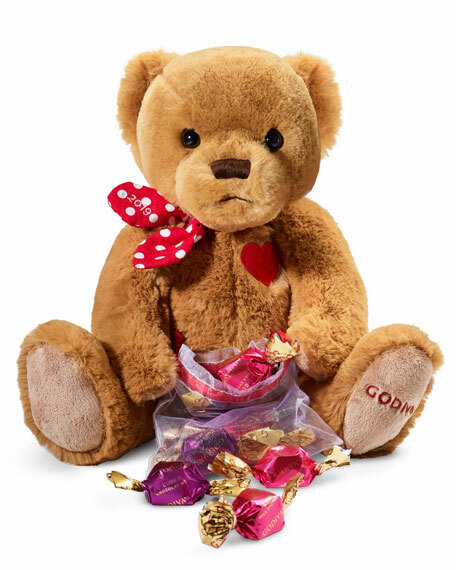 Godiva's adorable Limited Edition Plush Bear, sporting a red and white polka dot scarf holding a bag of six chocolate carrés in pretty pink wrappers. 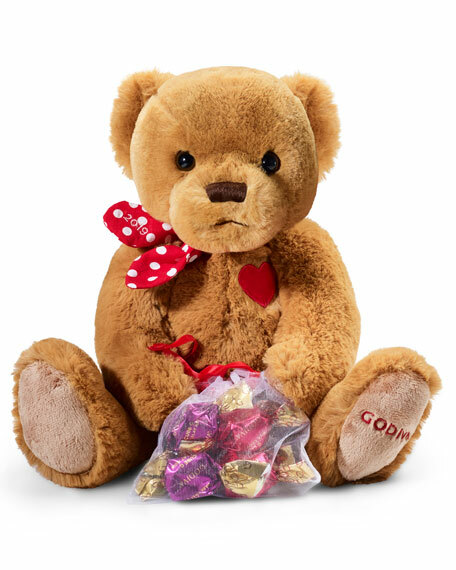 Limited Edition plush stuffed bear with bag of chocolates. 7.35"W x 9.2"D x 9.62"T.
Allergen Information: ALL of Godiva's dark, milk and white chocolate may contain: dairy or milk products, nuts and/or peanuts in addition to gluten. Any person with a dairy allergy, nut allergy or gluten allergy should NOT consume ANY of our products. Kosher OU-D. Contains milk and soy. May contain other tree nuts. For in-store inquiries, use sku #2909671.